When it comes to college admissions, many students will do everything in their power to get a leg up on other students seeking admission to the same university, and one way students can do that is by engaging with their prospective university online. NASHVILLE, Tenn. — When it comes to college admissions, many students will do everything in their power to get a leg up on other students seeking admission to the same university, and while grades, curricular choices, and test scores carry a lot of weight, there are many other variables that can help put a student at the top of the list. A relatively new tactic being used by universities is to monitor interaction by the student online, which can let a university know how interested a student truly is in going to the university if accepted. Through online engagement tracking, a university can tell how much interaction the student has had with the university on social media platforms, how much time they spend on the university’s website and which pages they visit, and even if a prospective student opens an email and how much time they spend reading the email. While the university can use it as a small tool to help them make decisions when it comes to admissions, it’s also good for the students themselves, as the more they interact and engage with the university, the more they can learn about their prospective school. “More than anything else, it’s not really an opportunity to game the system, but it’s an opportunity for you as a student and as a family to learn more about the institution, because institutions put a lot of good information out there for you to be able to learn,” Lewis said. 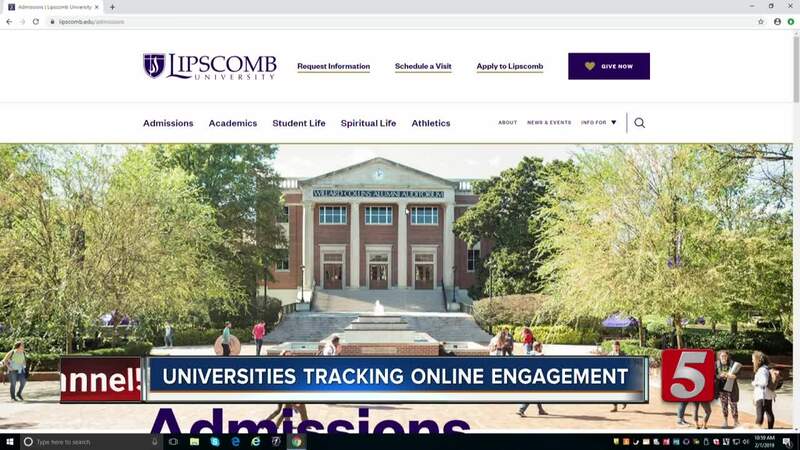 Lipscomb University does not utilize the technology at this time, but it’s something they’re looking to incorporate into their admissions office to potentially help them make decision in the future. Universities both large and small across the country use the technology, and the more selective a school is, the more likely they are to use the data they gather to help them in an admissions decision.